Since 2005, TDI has been a technical partner of Vectus Ltd, a Korean owned company dedicated to the development of world leading PRT technology. 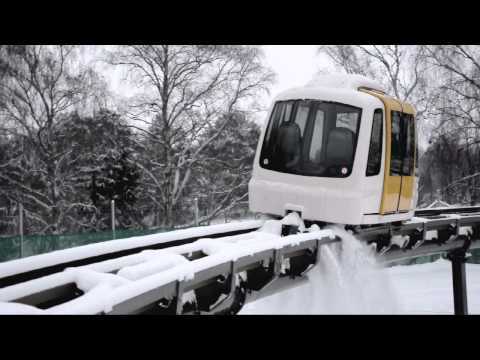 TDI's core involvement in the project has been the design, production engineering and prototyping of the cabins themselves, the first examples of which underwent extensive trials on a purpose built test track in Sweden between 2007-2010. 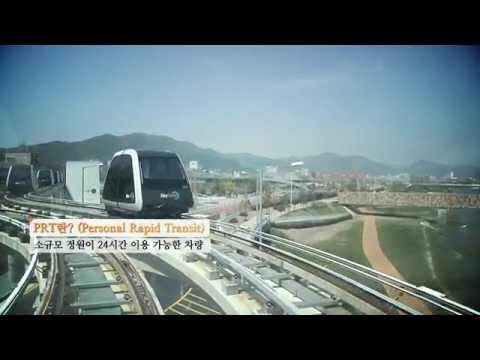 Forty production vehicles are due to enter service by the end of 2013 on the first fully commercial Vectus system recently constructed in Suncheon Bay, South Korea. 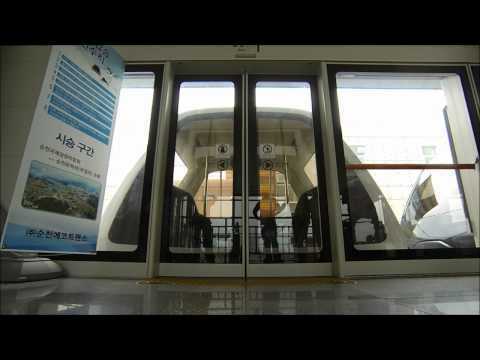 Vectus is in effect an intelligent, automated people mover (APM) which meets all the safety and operational standards required of a traditional rail-based transit system. PRT is not designed to compete with large public transport services such as metros or commuter rail systems; rather it is designed to enhance and improve the viability of such networks by providing feeder lines and links into areas where ‘heavy rail’ would otherwise be too expensive to install and operate. PRT can also provide the ‘last mile’ of transportation, for example, from a busy railway station, which might otherwise involve a taxi ride or a bus. As the vehicles are small-scale and lightweight, they can be carried on a much smaller, (ideally elevated) track infrastructure, requiring minimal ground take and reduced power consumption. 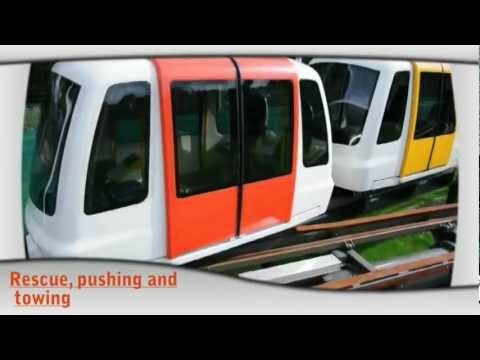 In terms of carrying capacity, Vectus is arguably the most cost effective public-transit solution in comparison with monorail or light rail system, for moving up to around ten thousand passengers per hour. TDI is the appointed sales agency for all UK projects. The vehicle driveline can be optimally selected according to specific requirements such as the local climate. For instance, a high volume of vehicles operating at very short headways, in a harsh winter climate, can be most effectively run and controlled with a propulsion system using linear induction motors (LIM). LIMs are independent of the friction between the wheels and the track and are virtually noiseless. With a less dense system, or in warmer climates such as in India and the Middle East, it can be more economical to utilise direct (on-board) motor drive to the bogies. At the core of the VECTUS technology is the safety-approved control system with features such as distributed, asynchronous, dynamic moving blocks and CBCT (communications based train control). It is independent of the propulsion system with each vehicle being individually controlled. It adjusts the speed, and on the basis of that speed, also the required distance from the vehicle in front in order to optimise traffic flow. At higher traffic densities, this gives a significantly improved throughput compared to more conventional 'synchronous control' and 'fixed block' systems.The ingenuity and flexibility of the control system, which differentiates Vectus from its competition, affords high capacity, substantial savings in travel/waiting time, easy system expansion, and convenient adaptation to specific applications without impacting on the overall safety of the system. The track is completely passive and is suitable for elevated, ground or tunnel applications. There are no moving parts in the switches because the switching is done on-board the vehicle and mechanical guidance is provided by guide rails. This means that the vehicles are inherently, mechanically locked onto the guide-way which is one of the key features for creating a high level of safety within the system. The track itself is manufactured from standard box and angle section steel profiles, which are retained back to the supporting structure of either lightweight concrete, or steel beam construction according to environmental demands. Additionally, if on-board propulsion is used, a continuous current collection system nominally carrying 500 VDC, is clamped on either side of the track. The current, standard PRT vehicle carries between six and eight seated passengers, plus an additional (up to six) standees. A 50-60 passenger Group Rapid Transit (GRT) vehicle, with a variable mix of both seated and standing passengers, is now under development for more conventional APM style shuttle operations. 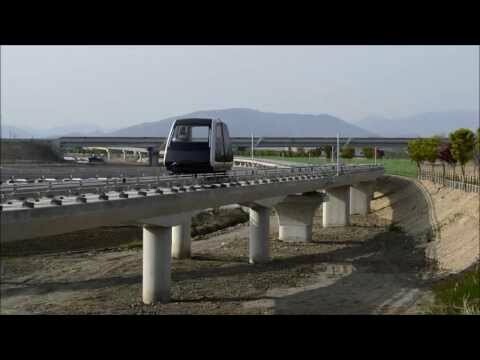 Looking to the future, it is envisaged that a combination of PRT and GRT vehicles operating along the same infrastructure will provide high capacity networks which can complement existing mass transit systems. In 2007, TDI designed and manufactured three prototype cabins (yellow, red and blue) to operate on a purpose built test track in Uppsala, Sweden. These vehicles were driven by in-track, linear induction motors, which is an ideal solution for operating in extremes of ice and snow. In 2011/12, working in partnership with Italian design house Pininfarina, TDI designed and engineered new production cabins which are now undergoing operational trials in Suncheon Bay. The extremely lightweight, carbon fibre body shells are designed for manufacture using advanced monolithic moulding techniques. The powertrain and custom micro-bogies were developed in-house at Vectus's own engineering centre in Sweden. © Copyright 2019 TDI - Transport Design International all rights reserved.